Place the potato into a pot of lightly salted water and simmer until soft. Drain water, then add milk and mash until smooth. Season with salt and pepper. Cover and set aside. Mix bread crumbs with lemon juice and zest and pat firmly onto the fish. Place in a hot oven and roast for 8 – 10 mins until the topping is crispy. 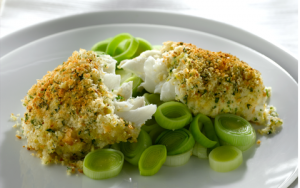 While the fish is cooking, gently fry leeks with the remaining butter over a medium heat until soft. Mix chopped herbs through the mashed potato, and place a spoonful onto each plate. Add the fish on top of the mash and serve surrounded by the creamed leeks. Our recipes are supplied by Bord Bia. Established in 2011, CS Fish specialises in catching, sourcing and delivering fish of the highest quality. Drawing on over 30 years experience from well-respected West-Clare fisherman Charlie Sexton, our new business continues to meet and exceed age-old expectations from our loyal and growing customer base. CS Fish is rapidly becoming the fish supplier of choice in the West of Ireland.